Pursuant to DepEd Order No. 12, s. 2004, DepEd Order No. 20, s. 2012, DepEd Order No. 52, s. 2017 and DepEd Order No. 037, s. 2018, enclosed is Regional Memorandum No. NCR-45. 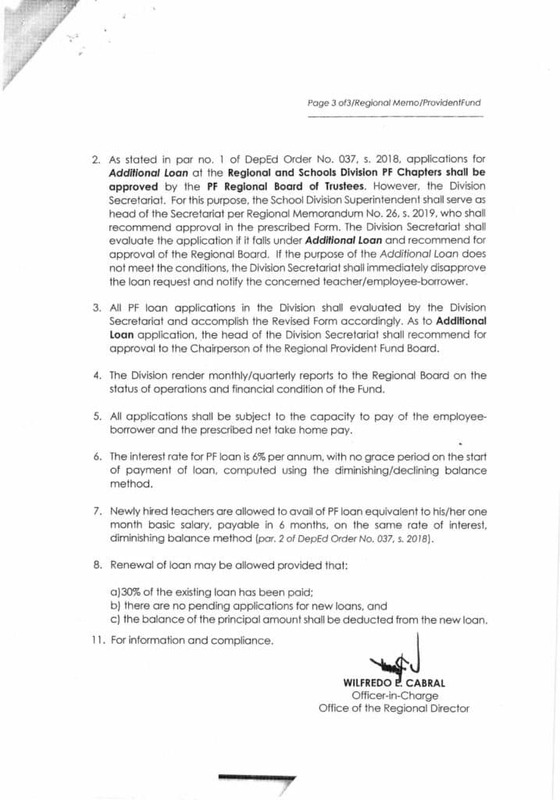 S. 2019, from Dr. Wilfredo E. Cabral, Officer In-Charge, Office of the Regional Director, DepEd-NCR, dated March 4, 2019, relative to the “Guidelines On Evaluation Of Provident Fund Loan Applications”, which is self-explanatory, for the information and guidance of all concerned. Attention is invited to item nos. 1 to 8 of the said Memorandum. This is issued pursuant to DepEd Order No. 12, s. 2004, DepEd Order No. 20, s. 2012, DepEd Order No. 52, s. 2017 and DepEd Order No. 037, s. 2018, to serve as guide in the evaluation and processing of applications for Provident Fund Loan at the Divisions. d. Not a comaker for at least three (3) PF loans with outstanding balances. As stated in par no. 1 of DepEd Order No. 037, s. 2018, applications for Additional Loan at the Regional and Schools Division Provident Fund Chapters shall be approved by the PF Regional Board of Trustees. However, the Division Secretariat. For this purpose, the School Division Superintendent shall serve as head of the Secretariat per Regional Memorandum No. 26, s. 2019, who shall recommend approval in the prescribed Form. The Division Secretariat shall evaluate the application if it falls under Additional Loan and recommend for approval of the Regional Board. If the purpose of the Additional Loan does not meet the conditions, the Division Secretariat shall immediately disapprove the loan request and notify the concerned teacher/employee-borrower. All Provident Fund loan applications in the Division shall evaluated by the Division Secretariat and accomplish the Revised Form accordingly. As to Additional Loan application, the head of the Division Secretariat shall recommend for approval to the Chairperson of the Regional Provident Fund Board. The Division render monthly/quarterly reports to the Regional Board on the status of operations and financial condition of the Fund. All applications shall be subject to the capacity to pay of the employee borrower and the prescribed net take home pay. The interest rate for Provident Fund loan is 6% per annum, with no grace period on the start of payment of loan, computed using the diminishing/declining balance method. Newly hired teachers are allowed to avail of Provident Fund loan equivalent to his/her one month basic salary, payable in 6 months, on the same rate of interest, diminishing balance method (par. 2 of DepEd Order No. 037, s. 2018). c) the balance of the principal amount shall be deducted from the new loan.